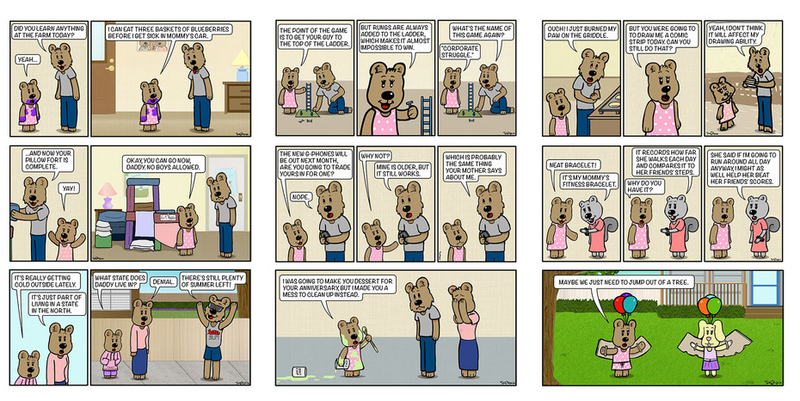 Maddie Bear Comics Now in iBooks & Paperback! The Maddie Bear Comic Strip Collection Volume 1 is now available for the iPad and Macintosh via iBooks and in paperback format. The iBook version includes: 93 Comics with Interactive Author’s Commentary, Behind the Scenes Sketches, and bonus video. The paperback edition includes: 93 Comics, 82 Pages, Author’s Commentary, and Behind the Scenes Sketches. Will you offer a version for Kindle? I was going to, but I’d have to reformat it. The paperback version has author’s commentary about each comic strip on the opposing page, but in Kindle format, there wouldn’t be an opposing page, it’s displayed as single pages. For the iBooks version, I put the commentary in interactive buttons, but the Lindle doesn’t support this.